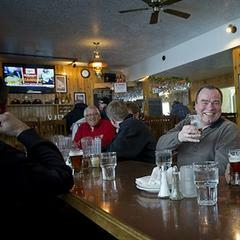 Hop heads flock to the Ice Axe Grill to sample delectable fare and pints from Mt. Hood Brewing Co.
Jeff McAllester makes beer on a mountain. It’s a very big mountain—one that you are going to ski down before stopping into the tasting room above the brewery where he works. It’s called Mt Hood, home to Mt. Hood Meadows, Timberline and Mt. Hood Ski Bowl ski areas. 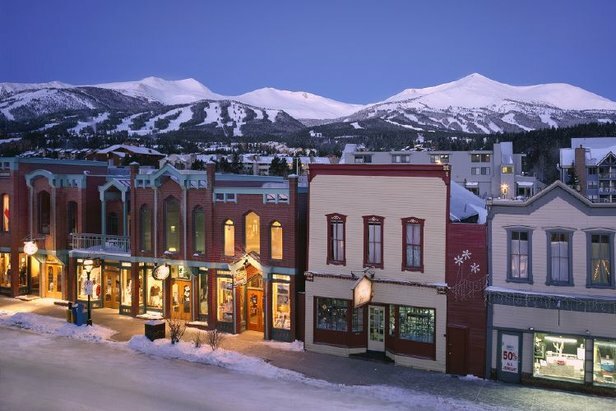 Folks can ski nearly year round in this part of the country, meaning there are plenty of opportunities to take some turns and grab a handcrafted beer. Not just handcrafted, but hard-to-get, almost cult-like beers made from mostly local ingredients and glacial water from the Cascades (one upping a certain Colorado Rocky Mountain mega brewery in the water regard). McAllester is one of two brewers at Mt. 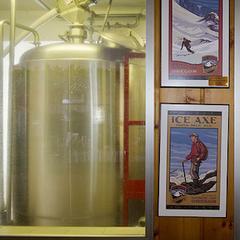 Hood Brewing Co., a small operation right at the base of the 11,237-foot peak. The brewery only distributes within the state of Oregon—and in kegs (2,400 annually to be exact). So if you want one of the seven mainstay beers or any of the seasonal offerings he and Head Brewer Tom Rydzewski craft, you’ll have to belly up to one of 50 or so bars and restaurants in the state that get a few kegs. Mt. 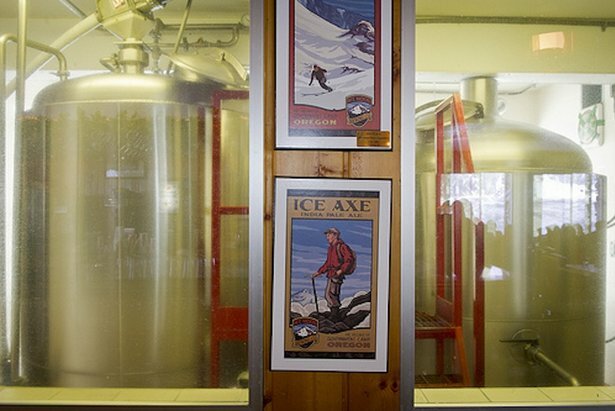 Hood Brewing Co. beer doesn't get any fresher than at the Ice Axe Grill. The Ice Axe Grill, located above the brewery, is the only restaurant to get the entire lineup of well-balanced beers, however. It serves as the tap room for the brewery, which is closed to the public. As with most brewery tasting rooms, samplers are offered alongside pints and pitchers. Beyond the beer, the menu at Ice Axe consists of fresh pub fare, including wings, pizzas, burgers and all the other snacks that scream for a beer at its side. On weekends, the place is packed. Weekdays are a different story; there might be three people at the bar, ordering samplers, pints or growlers (the only portable Mt. 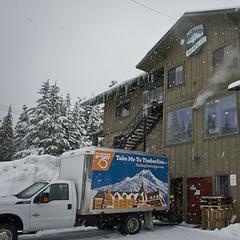 Hood beer vessel) from the tap.“If you want personal attention in the form of very lovely bar ladies, this is the place to go (on weekdays),” said McAllester, who joined the brewery team nine years ago after a career fighting forest fires for the U.S. Forest Service. Ladies aside, Ice Axe is the watering hole of choice for Government Camp residents who appreciate the delicate balance of the beers. That is to say Mt. Hood hasn’t fallen into the crazy trend of over-hopping beers to the pucker-your-face bitter levels. Its IPA registers at a mere 60 IBUs or so. “The world is hop crazy,” McAllester said. “I love a good hoppy beer like everyone else, but I like a balanced, malty taste.” That philosophy might not win any favor in the hop-head community, but it’s worked well at the base of Mt. Hood for more than two decades. 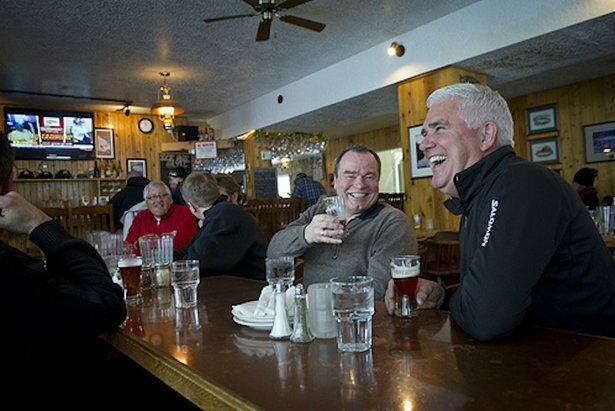 Aprés Ski Bar of the Week: The Paul Bunyan Room, Loon, N.H.